The Standard Poodle comes with a long list of standard names. The breed is thought to have originated from France or Germany. Many of the names in the list are popular German and French names for dogs. A sample of the German favorites include Bello, Dach, and Otis. At the top of the French dog name charts are Adele, Daphne, and Noel. 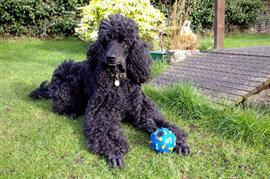 The Poodle was originally bred as a water dog and actually takes its name from the Saxon word podle meaning puddle. Some name ideas inspired by water are Brooke (English, 'Stream'), Kelby (Gaelic, 'Place by the flowing water'), and Vivien (French, 'Lady of the Lake'). Many female Poodle owners select elegant sounding names like Victoria, Isabella, Evelyn, and Annabelle. For male Poodles, sophisticated names such as William, Sebastian, Lucian, and Audrey are favorites. The Poodle is a very intelligent breed and certain names have been known to come across as more astute. Common names that exude cleverness are Dexter, Daria, Mackenzie, and Dalton. Some of our pages will contain a subcategory. A subcategory is a slightly more specific grouping than the main topic of the page. For a subcategory, we will include a separated table of names and corresponding descriptions. An example of a subcategory of Red Dog Names would be 'Dog Names Inspired by Red Wines'. If you have any subcategory ideas for the Standard Poodle Names page, we would love to hear them. Use the form below to submit your ideas.